We’d like to think we live in a relatively pristine area without need for environmental regulations or Superfund help. But 150 or so tundra swans a year tell us something contrary as they slowly die during their migration stopover along the Lower Coeur d’Alene River. Weather along the swans’ migration route dictates how long they stay in the lower Coeur d’Alene River Basin before continuing their migration to nest in Alaska, said Julie McKarley, Idaho Fish and Game Department conservation officer. A late spring such as we’re experiencing this year extends their stay and exposure to the toxic levels of lead they absorb from contaminated sediment as they forage on roots and tubers in the marshes and lakes, McKarley said. A century of Silver Valley mining and its waste didn’t bode well for life downstream. 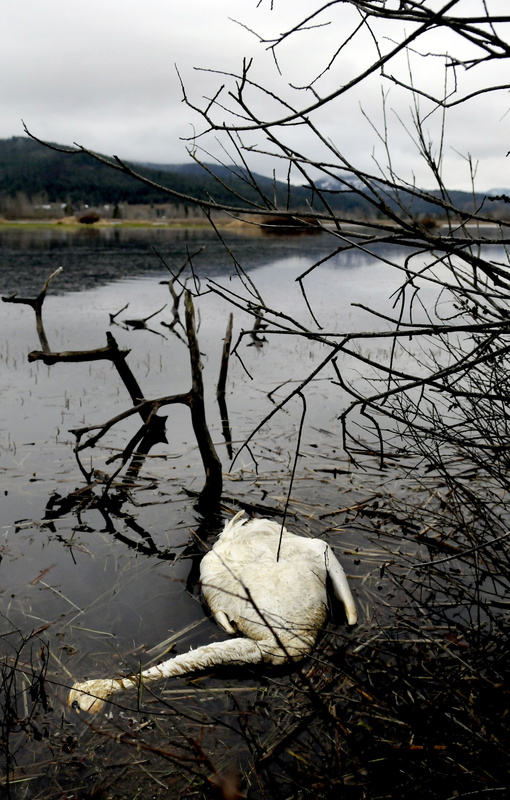 Federal research indicates about 92 percent of the swan deaths along the lower Coeur d’Alene River are caused by lead poisoning. “Approximately, 80 percent of the wetland habitats have high enough lead concentrations to be lethal to swans,” McKarley said. Other wildlife succumbs to the heavy metals, but she describes swans as “ big white beacons in a dull marsh. People notice their deaths more readily. “The best way to reduce swan mortality caused by heavy metal contaminated sediment is to provide clean wetland habitats that have low contaminant concentrations,” she said. “Ducks Unlimited, the U.S. Fish and Wildlife Service, the Environmental Protection Agency and others have been working in recent years to restore some of the wetland habitat in the lower Coeur d’Alene River Basin. But to date, the program has secured only a few hundred acres to be flooded for attracting waterfowl migrations to healthier stopover habitats.